WE ARE WAITING FOR NEW PUPPIES 10.5.2015. Download a list of dog show results from here. Kennel Bellabellax is a home based kennel located in southern Finland, Espoo. We have had miniature snautzers from the beginning of 90’s when we got our first dog called Donna (Darix Donna Daniela). After one year we took another miniature snautzer Frida (Darix Frida). 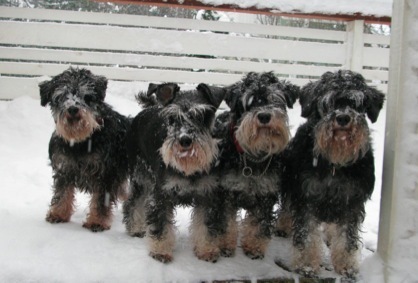 At the moment, we have four miniature snautzers called Bella, Edwina, Cindy and Ronja. You can find detailed information of our dogs from the Finnish pages. Our dogs are presented individually under link ”Kääpiösnautserit”. Our puppies are presented under link ”Pentueet”. All competition results can be found under link ”Näyttelytulokset” witch is in English as well. If you would like to know more about our dogs or coming puppies please contact us either by phone or email. Our contact details are presented on the top left corner of this page.